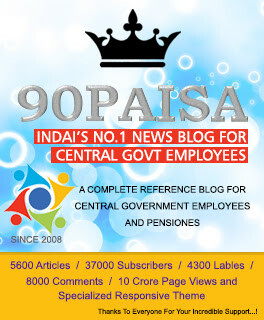 50% DA Merger and Retirement age almost disappeared from CG Employees Diary...! Expected the announcement on 15th August in the 'Independence Day' speech from our Prime Minster.... Read more..
Babus retirement age set to go up..! Retirement age of central government employees from 60 to 62..! During the cabinet meeting of June 3 that was presided over by J&K Chief Minister, Omar Abdullah, it was decided to increase the retirement age of state employees from 58 to 60, on par with the Central Government employees. It is worth mentioning here that the resolution marks the successful culmination of more than 6 years of protests and demands made by various employees unions across the state. There are also talks that the decision was made with the Lok Sabha elections in mind, which are due at the end of this year. The minimum age limit to qualify for state government employment has also been increased by three years to 40. A copy of the Government Order in this regard is given here. Once again, raising the retirement age has started making headlines. But this time, they are not rumours or false stories. There is some truth in it. A recognized political party has promised to increase the retirement age of state government employees from 60 to 65. In the election manifesto released yesterday, the party has promised to raise the retirement age of the state employees to 65. Retirement age for state government employees differ from state to state. Since the state governments do not follow the Central Government’s retirement age at 60, the demand has now started to show up in election manifestos of different states. State governments have the power to decide the retirement ages of its employees. The recent Budget happenings of the Kerala State Government in this issue are well known. Last year, there were a number of developments in this issue for the employees of Uttar Pradesh State Government. Since employees getting job at the age of 40 and retiring at 60 will not be able to complete qualifying service hence, will be devoid of benefits such as gratuity. Therefore, a demand was put forth to increase the retirement age..! While replying to this question, Minister Mohd Azam Khan said that the State Government had no plans to raise the retirement age. He also accepted that the maximum age for recruitment for State Government employment has been changed to 40. He said that there were currently no plans of increasing retirement age because it would adversely affect the employment opportunities of others. Amidst these developments, it is worth noting that the Samajwadi party, in its election manifesto, has announced that it would increase the retirement age to 65. Retirement age be extended to 62 to 65 for increasing employees life expectancy and their purchasing power while keeping in view retirement age in foreign countries and their retirement benefits.when at 60 salary increases bound to be retired to face health problems.therefore,the retirement age. be extended for optimum use of skilled labour force. In IITs Before 2nd CPC for the Group D employees superannuation age was 60 years and for 58 others (Faculty, Group A,B & C) it was age of 58 years. In 2nd CPC the superannuation age of others have been increased to 60 on par with Group D staff of IITs to maintain uniformity in the superannuation age all IITians. But unfortunately in the year 1998 for only Faculty member’s the superannuation age was raised up to 62 years. Again in the year 2007 without any parliament nod it was raised up to age of 65 years. But unfortunately we the employees of group A, B, C and D employees have not yet got the same benefit when all of us come under the umbrella of MHRD. Twice we met then president and the visitor of IITs Her Excellency Madam Prathiba Devi Patil but there was no positive reply from the government. And in a public meeting the Honorable Prime Minister announced that the retirement age of all Doctors working in the Central government have risen to 65. We the staff Group A, B, C &D are not yet given the above benefit. Assuming that Due to memory loss after the age of 60 the superannuation is offered to the employees but the maximum brain users of Faculty and Doctors are got the 65 years as superannuation age why not to Staff of Group A to D in IITs. Hence it is earnestly appealed to the Honorable Prime Minister of India to intervene in this matter with mercy and to announce superannuation age to Staff A to D of IITs.